I’ve been emailing back and forth with Dan DeBone, former service manager at Palmer’s Pursuit Shop (1990-1997) and on my trip to Northern California this week I met with Dan to shoot some media that I will eventually use for Glenn Palmer’s interview video and articles specifically on the progression of the Hurricanes, Palmer’s Pneumatic automation development and PPS history. I also recorded a few shorts on different topics, a couple of which I’ll upload in the upcoming days. 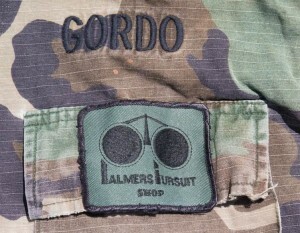 DeBone’s nickname, Gordo, came from a role playing character, a space marine with only one remaining braincell. 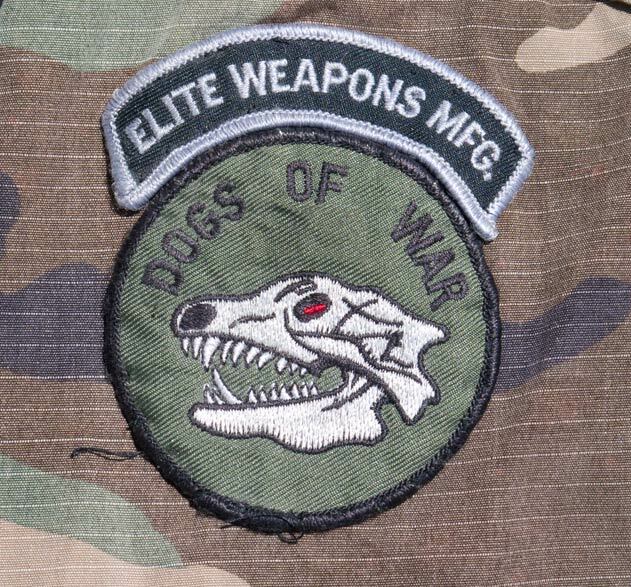 DeBone’s jacket featuring Elite Weapon’s badge above green background Dogs of War Patch. In this video Dan shows an early prototype Elite Weapon’s battle pump. 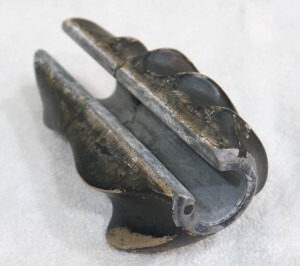 Forest Cox, of Elite Weapons, made Nelson, Sheridan, and Crosman Battle handles (grips), Sheridan Battle pump handles and also produced the early Elite rifles which fall in between the AGS rifle and the Hurricane. Angled top view of a bondo prototype Battle pump, originally belonging to Dogs of War team member, Tony (last name unknown). Top open view of the early battle pump handle which DeBone explains in the video. DeBone explains, the early pump handles that Cox made for the Dogs of War I and II (which many members of the Palmer’s community played on), were typically old sheridan metal pumps that were covered with bondo and formed to the individual members hands to set. After these handles set they were painted black. 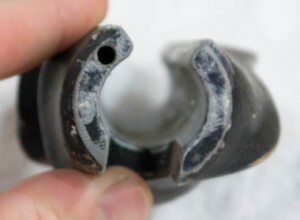 Side view of early bondo Elite Weapon’s battle pump. 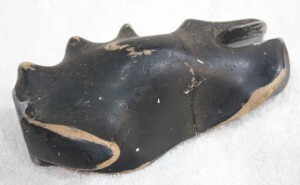 Brown base bondo was covered with a black paint. 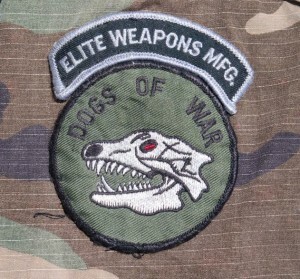 Many players on the Dogs of War had uniquely styled pumps handles that were adapted to their specific Paladin or Houndstooth direct feed paintguns. 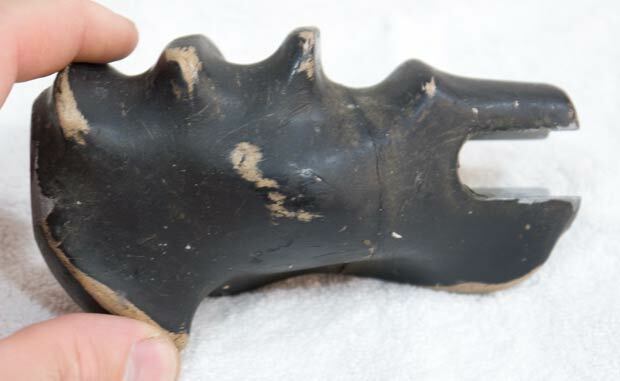 Tony (I don’t know his last name and if you do please post it in the comments) was left handed so this pump handle fits a right hand (which a left handed player would pump with. Right side view of bondo Elite Weapon’s battle pump. 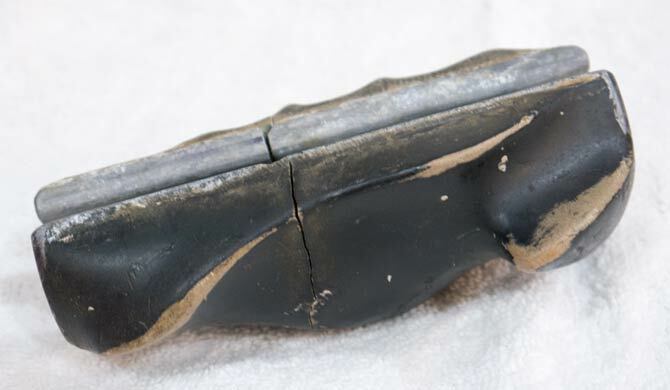 Crack is visible from years of flexing with temperature changes outside in storage. Back view of Elite Weapon’s battle pump. Bottom side view of Elite weapons Battle pump. The shots above show different angles of the bondo Elite Weapon’s Battle pump. 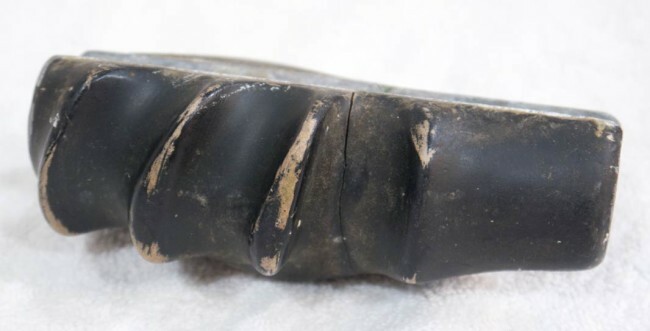 The bondo is originally brown and painted black. 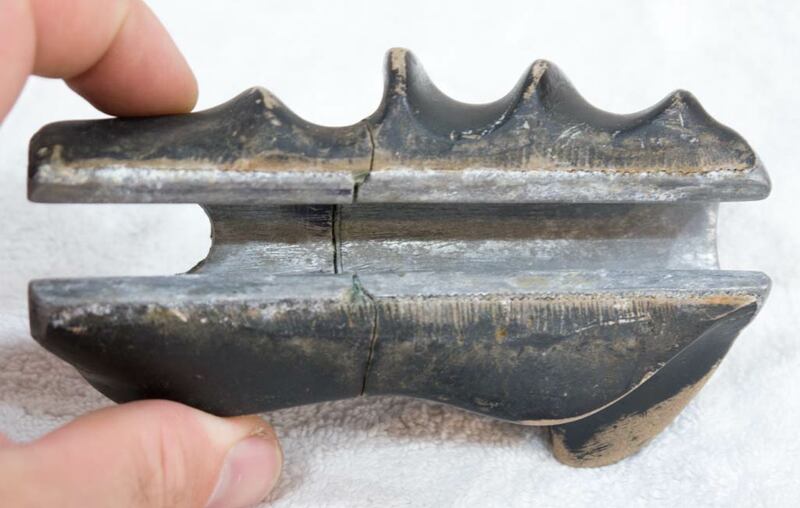 The pump handle base underneath is a Sheridan PMI-2, PMI- Magnum or PMI LB/SB pump handle. The Sheridan pump handle base is two piece screwed together and the crack has developed in the center of the sheridan handle. 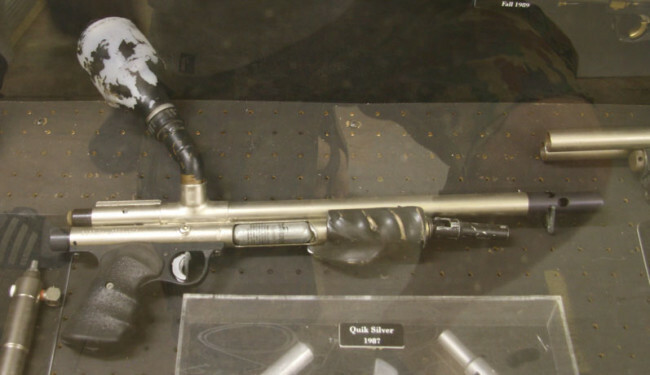 Palmer’s Paladin pump with early bondo battle pump in the Palmer’s exhibit at the EMR paintball museum. I shot this photo on a trip in 2009 to Pumpers Pandemonium. Other players had bondo Battle Pumps cut for the Quicksilver and on their specific rifles or pistols. An example can be seen at the EMR museum in the Palmer’s display (pictured above).